Mónica Larrazabal Alvarez-guerra is on a 2 month Startup Internship Program in Bali where she’s working with an Australian fintech startup. What projects are you working on during your time in Bali? I started developing the front end of the product. This involved user experience design and content strategy. After a while, I also started getting involved in planning and product management work. Working for a startup is completely different to working for a more established company – you get exposure to lots of different disciplines. I came out not knowing much about user experience so it’s been quite a steep learning curve. My first job was to see things through the user’s eyes to understand how they interact with our product. I’ve learned how to map a user’s journey through an online service, how to transform a user’s pains and gains into useful ideas and how to design a sitemap. I’m also learning about content strategy and architecture, how you display content and organize it. I’ve also been project managing the creation of the minimum viable product (MVP). This means helping decide which features should be in iteration one and I’m helping the team plan the product implementation roadmap. How do you find life at a coworking space? Outpost, the coworking space I work from is great. It has jungle views and there’s a swimming pool nearby. There are lots of events where you can learn from one another. They also encourage time to disconnect and take a step back from your work which is good for vision and perspective. What did you find surprising about being here in Bali? The most surprising thing is the lifestyle most people have. I’m learning how to manage work-life balance – there’s a big focus on self-improvement and wellbeing here. The startup scene in Bali is amazing. It’s much more diverse than you’d imagine. There are many different types of companies. The space I’m working from is home to everyone from coders to writers to designers. What kind of people have you met in Bali? I’ve met so many types of people. There are a lot of entrepreneurs here from all over the world – all at different stages of their journey. What kind of advice would you have for someone thinking of doing the same? DO IT! This has been a very special experience that I couldn’t have found alone. 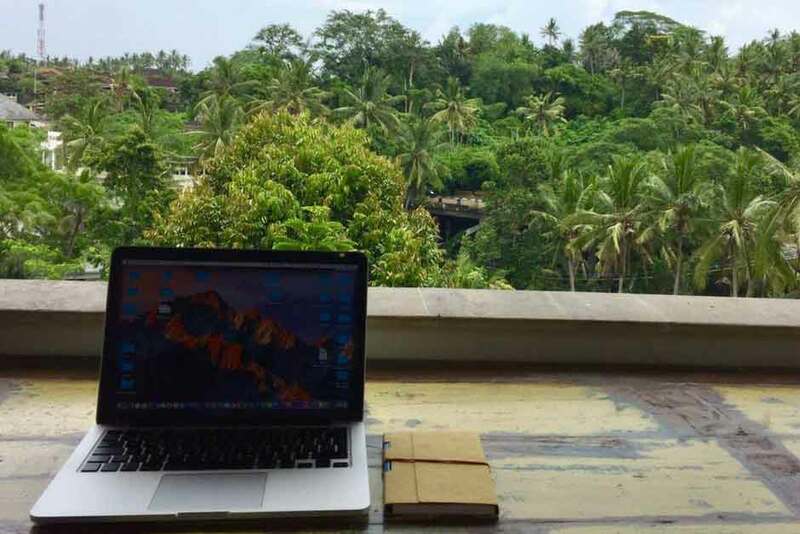 I’m a recent graduate from Spain and here I am on a tropical island working alongside a team of experienced Australians overlooking a jungle here in Bali. I could never have found something like this alone and it’s an experience I won’t forget in a hurry!